Corn Poppy (Papaver rhoeas): growing, planting, caring. Poppies adapt well to our gardens, and bring bright colour spots to our flowerbeds! Papaver rhoeas - the corn poppy, red poppy or corn poppy - is an annual herbaceous species in the poppy family, Papaveraceae, notable as an agricultural weed. It is an erect annual growing up to about 70 cm in height, with stems holding single large and showy, 5 to 10cm across flowers with four petals that are usually vivid red, most commonly with a black spot at their base. Not all poppies that are available commercially have red flowers. Selective breeding has resulted in cultivars in yellow, orange, pink, and white, with the Shirley Poppy probably being the most known cultivar. Corn poppies are annuals of fragile appearance, with a very narrow and hairy stem, not much branched, and light flowers. They are easily found in the wild in freshly stirred fields, crop fields and edges of roads and vacant lots. The red flowers forming real carpets are beautiful, but do not try to pick them: they do not hold it! Corn poppy cultivation is easy. Once sown on well-drained soils, it will cover them very quickly. On the other hand, the poppy,does not support transplantation. It reproduces only by sowing. Find a dry, well-drained spot in your garden. Poppies adapt perfectly to calcareous and poor soils - but they need sunshine to ensure a beautiful flowering, and moderatly wet ground. Sow in April, when the soil has warm up, or you can sow in the fall for early flowering. In heavy soil, you can mix sand with it to lighten and drain better. Moisten the soil by watering it in fine mist, then sow it just on the whole surface. Rake lightly, then tamp the soil with the back of the tool, taking care not to create puddles in which the seeds would accumulate. Keep the soil cool until emergence of the seedlings. The corn poppy does not fear drought. During the emergence of the seedlings and the first weeks after emergence, water gently - your seedlings are very fragile! If you have tried growing poppies in pans or pot, watch them during the summer - in open soil, beyond the first month, it is useless to water! 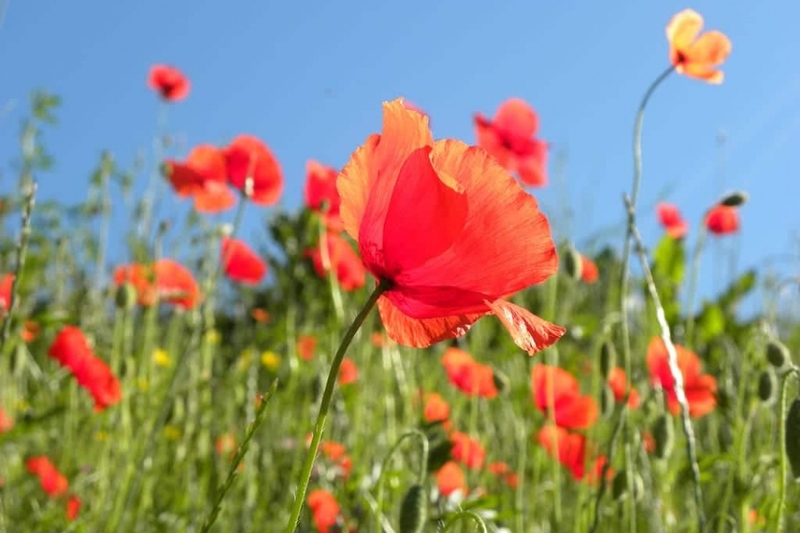 If you want to avoid the proliferation of seedlings - the corn poppy can become invasive! - cut the flowers as soon as they start to form their seed pods. Conversely, you can harvest the seeds! The corn poppy multiplies itself from one year to another thanks to the spontaneous sowing, but if you wish, you can harvest some seeds, to sow elsewhere or to give it to someone. At the end of flowering, you will find in the center of the flower the capsule: this one, once dry, contains a multitude of small black seeds. Warning ! Let the flowers dry before harvest: green, they would not be ripe. If the flowers of the corn poppy are edible - but not the stems, toxic - they do not please only us ... The poppy may be prone to aphid attacks. A spraying of baking soda water will work (two liters of water, a spoon of baking powder, some soap) In very wet soil it can be victim to powdery mildew - in this case, move the following year.